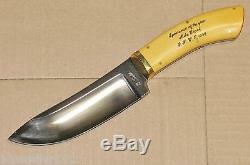 This beautiful custom knife is marked G Little Broadbent OR. It is 9 7/8 inches long overall with a 5 3/8 inch blade. The blade is deeply hollow ground and shiny mirror polished. It is NOT dark like it looks in the photos. 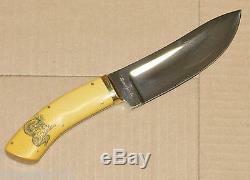 The knife has a brass bolster that is brazed in place and polished. Similar to how Cooper did his guards. The handle grips are a nice deep yellow ivory micarta. 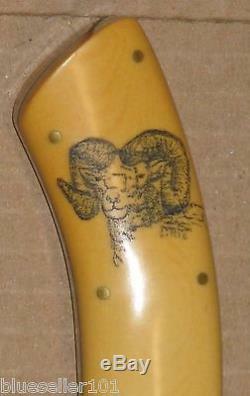 The grips have a curly horned mountain goat scrimshawed on one side and is marked on the other Sportsman of the Year Mike Cronk INWC 1988. The knife is very well made with a great fit and finish. It was obviously meant to impress. It looks much nicer in person than it does in my photos. It comes with a heavy duty leather sheath. This item is used and has some wear / minor scuffs & marks. The item "Large vintage Gary Little bowie hunting knife & sheath Broadbent OR USA" is in sale since Friday, February 05, 2016. This item is in the category "Collectibles\Knives, Swords & Blades\Fixed Blade Knives\Vintage (Pre-1970)\Custom Manufactured". The seller is "blueseller101" and is located in Chattaroy, Washington. This item can be shipped to United States.